Every church is different and there is no church quite like Christ Community. Our church is a great church. I mean that. You are a loving people. You are a committed people. 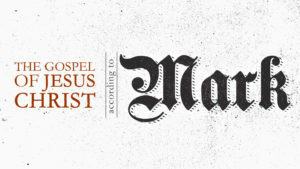 You are a gospel-driven people. Often churches are defined more by what they are against rather than what they are for. Churches can often be defined by infighting over silly things, rather than unifying around God’s mission. I have prayed consistently that our church would be a church that holds the mission of God high and will not be distracted or crippled by petty disagreements or arguments. Thank you! Thank you for loving Jesus and keeping the mission of God high. As we move forward in our mission of making gospel-centered disciples among all people for the glory of God, we do so in faith and in obedience. And we do so excitedly! 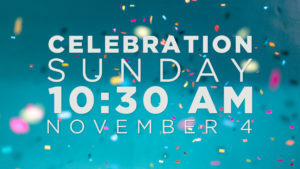 I want our whole church family to join together on Sunday, November 4 as we celebrate our 33-year history as a church family. It’s important for us to give thanks to God for His faithfulness to our church. We want to praise Him for where He has us and pray together for where He’s taking us! On Celebration Sunday, we will also celebrate the end of our We Believe giving campaign. Through your generous giving, we have been able to knock out a considerable amount of our debt in the last year, and I can’t wait to share that amount with you and celebrate! Reducing and eradicating our debt is critical for effectively advancing God’s mission through Christ Community. If you have not completed your commitment to We Believe, you can do so by giving online or you can bring your gift on November 4th. If you desire to make a special end-of-campaign gift, you can do so on or before Sunday, November 4. If you have met your giving goal and you desire to continue giving generously, you can give that directly to our ministry budget as we seek to determine our next steps forward with our financial debt. November 4 will big day for our church! Please invite others to join you and help make this Sunday a big one! This Sunday, October 28, we will be passing out brown paper grocery bags and providing you with a list of Thanksgiving meal items to fill each bag with. We desire for as many people as possible to fill one bag of Thanksgiving groceries to feed a family. One bag costs about $25. After you fill the bag, bring it back to the church building. Thanks to a partnership with Tyson Foods, they will be providing 400 packs of frozen chicken for these families to enjoy on Thanksgiving Day! 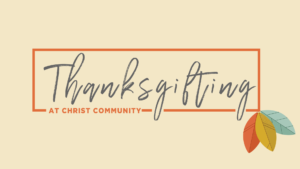 On Sunday, November 18, we will hold a special Thanksgifting service at 2:00 p.m. where we will share the gospel and share the hope we have in Jesus Christ! Then our members and regular attenders will help carry the bags to our guests’ cars to serve them as they go. This is an all-hands-on-deck ministry, so we need as many people as possible to make bags, distribute flyers/door hangers, and serve on the day of the event. Please go to our Thanksgifting page on our website to review this information and sign up to serve. We are excited and expectant to see how God uses Christ Community in our community this holiday season. Marci and I had a great weekend away last weekend. I was reminded of how the most important relationship I share outside of my walk with Jesus is my walk with my wife. With six children, we must make time to peel away and rest. I’m grateful for a church that encourages their pastor in making his family a priority! I’m excited to be preaching on Mark 9:14-29 this Sunday as we look at what a terrible situation Jesus finds as he returns from the mountain with Peter, James, and John. Pray with me and for me as we get ready. I look forward to worshiping our King together this Sunday.